Starring: Vincent Price, Carol Ohmart, and Elisha Cook Jr.
One of the most universal experiences in all of horror is the haunted house film. Just about everyone has likely had some experience with that creepy house in the neighborhood that nobody dares to go near. Or, perhaps, a local carnival or amusement park had a funhouse attraction with mechanical ghouls looming around every corner. At any rate, there is something primal about things that go bump in the night in an old, dark house. Cinematically, it’s one of horror’s oldest sub-genres, and it’s one that was resurrected on more than one occasion by b-movie maestro William Castle. In 1959, Castle and legendary genre actor Vincent Price invited movie goers everywhere to a party at the House on Haunted Hill. Frederick Lorren (Price) is a wealthy eccentric who is throwing a “haunted house party” for his fourth wife, Annabelle (Ohmart). He’s thrown in an enticing incentive for the party-goers: if any of them manage to stay throughout the night, then they will receive $10,000 each. The titular house has a tormented history, full of demented tales of murder, as no less than seven people have met their grisly end there. As the witching hour approaches for our guests, spooky occurrences become more frequent: doors mysteriously close, chandeliers fall from the ceiling, and the ghosts of the long-dead victims begin to haunt the guests. The haunted house of my youth was actually of the funhouse variety. My family would make an annual trek to the beach, which featured an amusement park; my favorite attraction there was the “Haunted Hotel,” a neat little ride that featured the usual assortment of automated goblins and madmen. If there was ever a cinematic equivalent to that now defunct haunted hotel, it would be the original House on Haunted Hill. It’s a fun little thrill ride, full of b-movie spooks and gags that are still charming fifty years later. In many ways, it’s the epitome of Castle’s output and stands as a great representative for haunted house pictures. It’s become a favorite of mine over the years for its ability to perfectly capture the essence of a funhouse. It does this because Castle places atmosphere at the forefront and uses appropriately creepy set-pieces to bring the house itself to life. One might as well call it the titular character, as it certainly seems to have a life of its own. The film’s opening monologue features the house’s owner referring to it as “the only really haunted house in the world,” as he recounts the house’s murder-laden history. It’s the perfect tone-setter because every haunted house needs a scary story behind it. The house doesn’t take long to live up to its reputation--when we first get a glimpse of it, it is of course covered with cobwebs and bathed in shadows. The door shuts itself behind the guests when they arrive, which tells us that our ominous ride is about to begin. 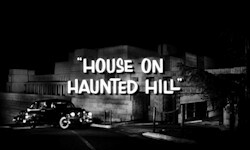 House on Haunted Hill is mostly a visual affair, relying on Castle’s use of macabre imagery and unsettling camera angles. The black and white photography makes great use of light and shadows and gives the house an eerie look. There’s plenty of other morbid touchstones--the guests arrive in hearses, and each of them is given a gun that’s housed in a coffin. The ghouls and other thrills are realized in a low-budget fashion that actually feels very appropriate by the film’s end. The film’s most infamous sequence features a walking skeleton, an effect that was no doubt even more awesome in theaters. In typical Castle fashion, this sequence featured a gimmick that allowed a skeleton to fly over the heads of audiences with the help of an elaborate pulley system. Even when confined to two dimensions, this scene still stands as one of the coolest climaxes of any horror film. The importance of Vincent Price’s presence can’t be understated, of course. It’s a classic Price performance that’s both elegant and deranged. His velvety voice is typically disarming, and there’s a sort of regality that hides a more maniacal side. Price’s chemistry with on-screen wife Ohmart is especially effective, as the two trade sadistic barbs about killing each other. The two’s frankness is rather startling; for example, when Price pours a glass of wine, Ohmart assures him that she hasn’t poisoned it. Later in the film, Price wonders aloud about how all men have contemplated killing their wives at some point. It sounds absurd, but it Price pulls it off with ease. The rest of the film is peppered with other effectively ominous lines for the cast to speak. Most of the best lines go to Elisha Cook, whose character owns the house; he’s a paranoid, almost raving lunatic who feels right at home in the dusty old mansion. As far as haunted houses goes, one can do a lot worse than the one here on Haunted Hill. It’s a great B-movie fright-fest that’s both clever and spooky, full of both ghoulish sights and haunting sounds (Von Dexter’s score is a moody, b-movie complement). Interestingly enough, we should also thank the film for drawing the attention of Alfred Hitchcock, who was then inspired to direct his own low-budget thriller called Psycho. The fate of each film has been rather disparate, and it’s reflected by their home video status. Psycho, of course, has been a cash cow for Universal since 1960, while House on Haunted Hill fell into the public domain. 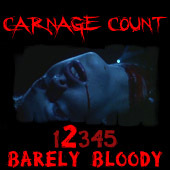 This means it’s readily available on dozens of releases and is likely already kicking around in most fans’ collections. For my money, your best bet is to track down the Warner Brothers release from 1999. Despite being over ten years old, the presentation holds up well: the anamorphic widescreen transfer was taken from pristine elements that faithfully reproduce the film’s black and white photography. The mono soundtrack is a bit soft, but mostly audible. You can find this disc as one side of a double feature with the film’s 1999 remake as well. If you’ve not ventured into this one yet, you owe yourself a visit…the ghosts of the house will be glad you’re there! Buy it!